Valdimar Haraldsson, in The Whispering Muse, finds that fish are both sustenance and inspiration. His preoccupation with fish consumption by the Nordic race prompted Haraldsson to publish twenty years’ worth of the journal Fisk og Kulture; one can read the full account, he says, in his Memoirs of a Herring Inspector. When the father of an old friend invites him to join him on a merchant ship traveling from Norway to Turkey, Haraldsson accepts. He soon finds that the shipboard postprandial entertainment is provided by second mate Caeneus, who holds to his ear a splinter of wood that we later learn is from the talking prow of the ancient Argo. Caeneus relates a tale of the Argonauts visiting the Isle of Lemnos, where the men have been killed and the women now wish to begin the happy task of repopulating. Thus, the journey of the Argo is delayed while the journey of the MS Elizabet Jung-Olsen is delayed. The captain has sailed up Fredafjord to a sawmill where logs are cut, pulped, and pressed into sheets of paper. His intention is to load two thousand tons of paper for delivery to the Black Sea coast. It does not escape our notice that this is the creation of the stuff upon which literature is printed. Haraldsson spends many happy hours watching as the hold is filled with pristine paper. Though the muse confers, the captain commands. Caeneus must attend to duties following dinner one evening, and Haraldsson finally receives the invitation to share his own work. He describes the physiology of fish and explains how the Nordic race benefited mankind with great inventions such as the steam engine and the airplane, while, on the other hand, Roman society, populated by short people, fell into ruin. Such are the benefits of eating fish. Haraldsson delivers the lecture with a self-described “consummate skill” and is puzzled when the reaction is much like his own review of the evening’s poor fish stew: “The resulting mixture was far from appetising and formed a grey gloop on one’s fork like spiky rice pudding.” For some it seems, the muse may whisper, and for others it may whisper sweet nothings. 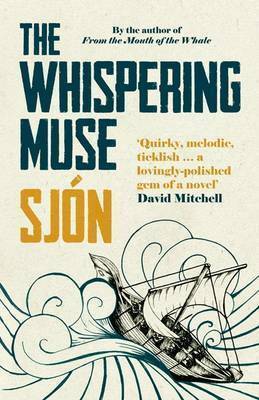 When a poet such as Sjón (Sigurjón Birgir Sigurdsson) writes a novel, the reader may expect the elliptical in both senses of the word—economy and ambiguousness. 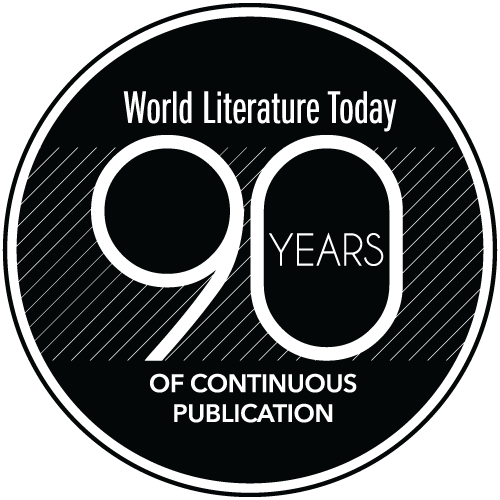 Seamlessly translated by Victoria Cribb, the book suggests there are those who scrawl along, ultimately becoming connoisseurs of their own drab blatherskite, and those who are provided with the gift of a compelling tongue. Here, no story stands alone. The legend of Jason and Hypsipyle leads to Sigurd and Gundrun, which leads to the Argo and the MS Elizabet Jung-Olsen; stories are doubled, as though perceived through a Viking sunstone. 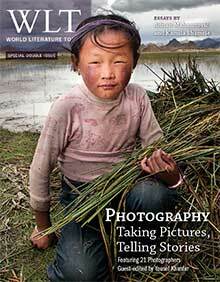 “Taking Pictures, Telling Stories,” a portfolio devoted to Photography and Literature, headlines the March 2013 double issue of WLT.